Aromatic herbs have been used throughout history in a number of ways; fragrant soaps, pomanders, bath-water fresheners, potpourri, sachets, incense, scented candles, and natural herbs to sweeten sour breath are common in most cultures and popular today. Aromatic herbs have the advantage of driving away insects, and the mint family has an especially excellent reputation for keeping pests away from people and other plants. It is often grown among other plants, like members of the cabbage family. Spearmint is grown most commonly, but peppermint, and apple, lemon, and pineapple mint are familiar occupants of many gardens. Mints are perennials that spread rapidly and grow quickly. The mint family is called Labiatae and includes about 160 genera, of which Mentha includes the true mints. Spearmint and peppermint are grown extensively in a surprisingly robust health mint industry that produces mainly oil. Over 70,000 acres (28,328 hectares) of farmland in Indiana, Michigan, Washington, and Oregon produce these two types of mint for a wide range of commercial uses. For natural solutions to the problem of maintaining sweet breath, a small piece of nutmeg or angelica root can be chewed, or a piece of the herb called mace can be placed in the mouth for several minutes. Obviously, the most common herbal breath mints are the mints. A leaf or two from any of the commonly grown mint plants, including peppermint, can be eaten to freshen the breath and aid digestion. Many references about herbs provide recipes for making toothpaste and mouthwash from pepper-mint and other herbs and natural ingredients that avoid the detergents and sugar found in commercial products. Parsley, fennel, watercress, alfalfa, and pulverized nettle leaves all contain chlorophyll that is used in many commercial breath fresheners like Clorets. Chewing a bud of clove immediately relieves bad breath (especially after eating garlic-laden foods) and aids digestion, as does clove chewing gum. Over 4,000 years ago, people sucked on whole cloves to cleanse their breath. Clove—rather than mint—is probably the oldest and most common herb used for fresh breath. The Pharisees collected tithes in mint and other sweet-smelling herbs, and the Hebrews and Christians spread it on the floors of synagogues and churches as a symbol of cleanliness and hospitality. In the Middle Ages, anise seed was chewed slowly as a breath freshener (and to cover up odors from liquor consumption). Cardamon seeds are also natural breath sweeteners that have been chewed both in the Orient and in Europe since ancient times. In colonial North America, settlers discovered that small bits of calamus (sweet sedge) root and pieces of dried orris root (the root of the Florentine iris) had similar sweetening effects. Tablet-shaped mints are made in a rotary tablet press, consisting of four punch and dies that move along belts. Large rollers continuously move the belts and the punches and dies are pushed up and pulled down by adjustable cams. on the European continent, and in the United States. But the candy market was as volatile in the 1800s as it is today, and manufacturers have always searched for something new. In 1869, Thomas Adams, an inventor from New York, stumbled on the idea of replacing paraffin wax that was used like chewing gum with chicle, a rubbery fluid produced by some trees. The pelletized chicle was sold in boxes, and new flavors of the chewing gum were introduced over the next 100 years. Many of these flavors had breath-and health-enhancing properties; examples are pepsin (a digestive aid) in Beeman's gum, sassafras and licorice, cloves, Dentyne (the first gum aimed at dental hygiene), Sen-Sen and chlorophyll, cinnamon, and many varieties of mint. In the 1950s, American Chicle introduced Certs. The need for a mint dedicated to fresh breath had been identified in consumer research. Toothpaste and mouthwash were simply not convenient or portable, and candy mints had no proven association with fresh breath. Certs combined both candy and a breath freshener in a small package. The breath-freshening ingredient was "Retsyn," a mixture of copper gluconate and cottonseed oil that was trademarked by American Chicle. A sugar-free product was introduced in 1982 and reformulated in 1987 with NutraSweet; 1988 retail sales of both the sugar and sugar-free versions of Certs topped $190 million. Also in 1988, the company introduced Sugar Free Certs Mini-Mints, and this began the mini-mint fad that still has a strong grip on the breath-mint market in 2000. Ten years later, in 1998, the breath-freshener market grew by 13% in one year, while all other gum and candy expanded by only 2.3%, according to the National Confectioners Association. Breath mints have not been without controversy. The Nutrition Labeling and Education Act requires that every food product have a serving size and the equivalent number of calorie stated on the package. Breath mints posed a significant problem for the Food and Drug Administration (FDA), which took six years to study how to classify serving size and associated calories. Hard candies have a single serving of 0.5oz (15 g), and the FDA initially lumped breath mints in the hard candy category; but 0.5oz (15 g) equals a whole packet of breath mints. The FDA then decided 0.07oz (2 g) (about the same as a single Certs or Breath Saver) would be a suitable single serving. The mini-mint producers objected. Lawyers for Tic Tac claimed that this single serving would be five of their mints. The argument shifted back and forth until the FDA finally ruled that a single serving should equal a single unit—one mint—regardless of size. Effectiveness of breath-freshening was left to be determined by the consumer. The bulk of all breath mints is some form of sugar or a sugar substitute. Sugar is present as sucrose or dextrose, and the most common sugar substitutes are sorbitol or zilotrol, (chemists classify both of these as polyhedric alcohols). Binders hold the particles of the other dry ingredients together. Common binders are corn syrup, natural gums like gum arabic, and gelatin. Tablet-type mints also include lubricants that help the dry materials flow through the press, prevent them from sticking to the machinery faces, and pop out of the dies after they have been compressed. Magnesium stearate, stearic acid, and calcium stearate are lubricants in many candies and breath mints. Some mints also include disintegrants that help the mint dissolve, disperse, and become absorbed during digestion. Natural or artificial flavors and the breath-freshener complete the raw materials. Most companies closely guard the secret ingredients of the breath-freshener itself. The outside of the mint may look polished; carnuba wax is the secret to the gloss. Breath mints come in three basic configurations. The mini-mints like Tic Tac and Blitz mints are tiny tablets or compressed mints that have a hard outer shell made by a process called panning. The design of the mint itself is tiny with a compressed center that is easy to manufacture and an attractive shell with a bright color, cute shape, or shiny finish. They are packaged in small, convenient, eye-catching boxes; several of these have won international design awards, showing that packaging is just as important in the design process as the contents. Roll mints like Breath Savers and Certs are shaped like Life Savers but the holes in the centers may be filled. These mints are hard; the filled center is usually brightly colored. They are also made by the tableting or compressed process. The packages are convenient rolls and have the familiarity of Life Savers. Other hard mints include square-shaped Velamints from West Germany, which are packaged in squared tubes, and Altoids from England in their collectible mini-tins; these mints are made from an extruded dough. Mints with soft centers are the third class; they can be made in a batch process or by panning. Mentos from Holland and Vikings from Denmark are the leaders in this field. These mints are larger in diameter than the mini-mints, and they have a hard outer shell with a chewy center. Recent additions to the mint marketplace include Testamints (with Bible verses on the tins) and Web Fuel (tins shaped like computer mice bearing Internet web site addresses). Many of the leading mints manufactured in Europe were originally aimed at the children's candy market, but this market has very rapid shifts as children's interests change. When sales began to decline among children in Europe, the manufacturers shifted their attention to the adult market in America and the preoccupation with sweet breath. Some of the designs stayed the same despite the shift in market; the bright oranges, reds, and greens of some of these mints themselves and especially their packaging are holdovers from targeting European children. The adult market in the United States for candy generally has grown steadily since about 1980. By a simple shift in emphasis, Ferrero, the European chocolate company that makes Tic Tacs, was able to keep its eye-catching colors and packaging but market the mint as a "1.5-calorie breath mint." The low calories, breath protection, and cute presentation appeals particularly to young women; from 1980 to 1990, Tic Tac's market share rose from 2% to 12% with this change in advertising approach. Tableted candies and mints are an offshoot of the pharmaceutical industry that makes pills. The same accuracy that produces just the right dose in a lozenge or tablet for medicinal purposes also makes mints efficiently with the right distribution of flavor and breath freshener. Tablets are made with rotary presses that use a rotating die table and compression rollers to turn out as many as 10,000 mints per minute. 1 The ingredients for mints arrive at the factory in powder form. They are granulated in a mixing and bonding method that helps them flow through a tablet press. The process involves pulverizing (pounding) them to a fine consistency, mixing (most often in a dry process, although wet mixing can be used), compacting the ingredients, sizing the finished grains (sorting out the coarse particles), mixing the ingredients, and flowing them into the tableting machine. The moisture content is controlled throughout the process (whether it is wet or dry), and the granules are dried on bed dryers (flat systems) or rotary dryers. Mixing—one of the last steps—is the process in which flavors and active ingredients like breath fresheners are added for the most uniform distribution. Lubricants are mixed last so they coat all the other ingredients well. 2 The prepared, granulated, mixed ingredients are conveyed to the tableting machine. While this sounds straightforward, the conveyors cannot have any bends or turns that might sort the materials, and temperature and moisture have to be strictly controlled along the route. Some ingredients, particularly the lubricants, begin to separate from the other ingredients if conditions aren't correct. Some flavors like grape react with sugars if there is too much moisture in the air and begin to turn brown; gelatin also browns if conditions are too warm or dry. 3 The rotary tablet press consists of four punches that move along an upper belt paired to four dies that move along a bottom belt. The belts themselves are continuously turned around large rollers. The punches and dies are pushed up toward each other and pulled down by adjustable cams. As the ingredients enter the rotary tablet press, the granulated ingredients are channeled into a feeder (the upper punch) that fills a die seated in the bottom of the pair. The cavity of the die has to be filled with the volume of granulated ingredients. The second stage of the press adjusts the weight and scrapes excess material off the top of the die. In the third, compression stage, the cams drive the upper punch and the lower die together, compressing the ingredient into a tablet. The punch and die have been designed to have the shape of the breath mint and possibly its name cut into it, so the compressed result has the identity of the mint firmly stamped in place. 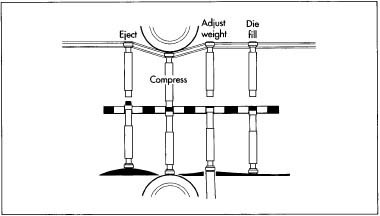 In the fourth step, the lower cam pushes out (ejects or extrudes) the stamped mint and the upper part pushes it out of the press where it is collected in a bin. 4 The bin funnels the compressed mint tablets to the next process. This may be panning or packaging. 5 Some mints are made much like hard candies, and are cooked as a batch that flows in a continuous process that shapes and sizes the batch ingredients into the shape of the mint. In a dry, uncooked process, a dry dough with a sugar base is made. The batch or the dry dough is funneled through a roller with a general shape much like a pointed ice cream cone but with the opening shaped to the desired form of the candy, perhaps a triangle, a diamond, or a barrel. Either the cooked batch or the extruded dry dough is forced through this roller, and each candy length is cut as the ingredient emerges. Extruded dough mints can be recognized by their irregular surface. 6 Panning is not usually used to make an entire candy or mint but to give a mint a finished coating. Hollow globe-shaped pans with a hole in one side are made of copper and are rotated much like small cement mixers so the hole stays angled upward. Mints made by compression, batching, or extrusion are placed in relatively small quantities in the pans. Sugar, flavors, and colors are added; as the pan rotates, a hard shell of the sugar forms on the outside of the mint. In the same process or another panning operation, wax or a polishing agent may be put in the pan with the mints to give them an attractive luster. The rotation of the pan can also help develop the finished shape of the mint; the oval shape of many of the minimints is created during panning. 7 When the mints are finished by the processes described above, they are carried to packaging machines to be wrapped. Usually, they are carried a short distance on conveyors, and inspectors watch the passing flow of mints and pick out broken or imperfect examples. Depending on the type of packing, the mints may be simply channeled into a funnel that deposits them in small boxes or tins. If they are wrapped in tubes of paper, they are vibrated and gently pressed into line and wrapped with the preprinted packaging. The packages must also be carefully designed to protect the product; an inner paper of foil, a foil/wax paper laminate, or odor-free plastic is needed for roll mints. Cellophane wraps over paper, tin, or plastic novelty boxes may be needed to keep the mints inside isolated from air and moisture. The plastic novelty packs were made possible by the uniformity of compressed candies and mints. Pez-Haas originated the famous Pez dispenser because the square candies fit so neatly. Similarly, high-speed wrapping of roll-type candies was pioneered by the Life-Saver Company. Quality control of breath mints begins with chemistry when the food scientists who devise a new mint select the combination of ingredients, processes, and machinery that can produce the desired product. Throughout the process, few hands touch the operation but many eyes watch. The machines are maintained and cleaned with great attention to detail, not only for health and safety but because some materials are abrasive to the expensive dies that form the mints. Rooms for various processes have controls for temperature, light, and humidity; dust is also carefully controlled because the very fine dust generated from pulverizing ingredients can actually explode in the right combination of conditions. Skilled observers watch the high-speed presses, the turning pans, and the sorting and packaging machines. Mints are rejected for the slightest flaws, yet there is little waste because they can be reground and mixed back into the powders to form later batches. Breath mints seem to have a secure place in American life because of the importance of appearance, good health, and cleanliness in our modern lifestyle. Mints, however, are part of the volatile candy and confection market and frequently change face to match the latest trends. The breath-mint manufacturers smell out the latest trends by testing their ideas—from new packaging to actual mint samples—among focus groups of actual consumers. If the focus groups endorse the product, a mini test market, like a small town, will be given samples to assess wider appeal. If the new breath mint passes that test, large-scale sales and marketing campaigns are launched. The explosive sales of mini mints show both the present and the future of the breath mint; clever, eye-catching packaging that makes breath mints portable and trendy have helped and will help consumers and manufacturers alike breathe easily. Bremness, Lesley. The Complete Book of Herbs. New York: Viking Studio Books, 1988. Castleman, Michael. The Healing Herbs: The Ultimate Guide to the Curative Powers of Nature's Medicines. New York: Bantam Books, 1991. Hylton, William H., ed. The Rodale Herb Book: How to Use, Grow, and Buy Nature's Miracle Plants. Emmaus, PA: Rodale Press Book Division, 1976. Kowalchik, Claire, and William H. Hylton, eds. Rodale's Illustrated Encyclopedia of Herbs. Emmaus, PA: Rodale Press Book Division, 1976. Thomas, Lalitha. 10 Essential Herbs. Prescott, AZ: Hohm Press, 1996. Edmondson, Brad. "But Candy is Dandy." American Demographics 9, no. 5 (May 1987): 22. Gordon, Raymond. "Invaders in Small Packages." Forbes 135 (April 22,1985): 122. Poniewozik, James. "It's Not Just a Breath Mint, It's a Web Portal." Fortune 138, no. 4 (August 17, 1998): 40. Skrzycki, Cindy. "Sizing Up Breath Mints Leaves a Bad Taste in Some Mouths." Washington Post (January 16, 1998). American Chicle Group. Pioneering the Confection Industry. 1990. Enrique Bemat F.S.A., manufacturer of Smint. http://www.smint.com (December 22, 2000). Ragold, Inc., manufacturer of Velamints and Dilbert Mints. http://www.ragold.com (December 22, 2000).